EVERYTHING LOOKS ROSY AT THE END OF A TREND! Hello everyone, hope your well. A couple of interesting stories dropped today. At the end of an economic trend, GOOD NEWS IS EVERYWHERE, AND THE FUTURE ALWAYS LOOKS BRIGHT! The future is bright everyone, we dont need no bank regulation! But the deregulation of the banking industry speaks to the confidence that people have in a bright future free from trouble and strife. A few thoughts on the U.S housing industry. 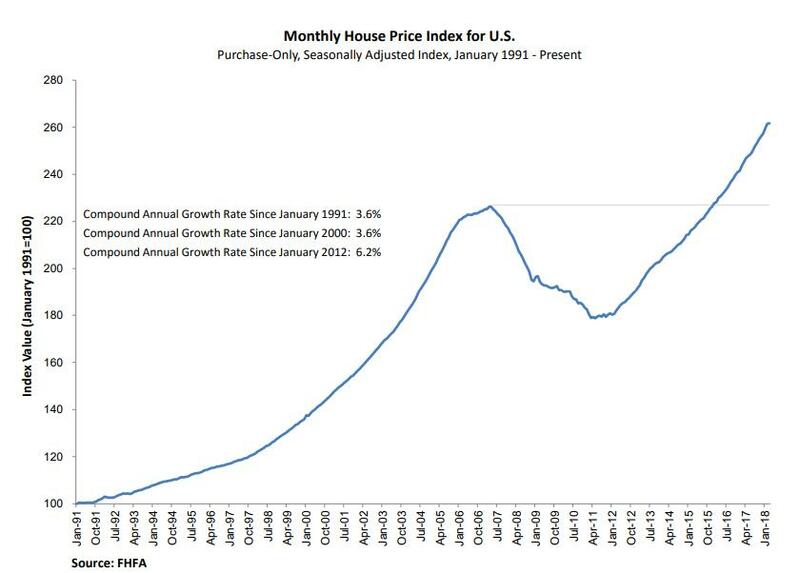 The U.S house price index is sitting at all time highs now 18% higher than the peak in 2007. With mortgage debt now topping the the 2008 high. And the labor force participation rate back at levels not seen since 1978? And less people are working as a % of the population. Time to short banking stocks again?? USD: Core Durable Goods Orders m/m, Fed Chair Powell Speaks, Revised UoM Consumer Sentiment. EUR: German Ifo Business Climate, GBP: Second Estimate GDP q/q, BOE Gov Carney Speaks, JPY: N/A. EURUSD turned higher today in a corrective looking move, Wave 'ii' higher was expected, The short term target at 1.1750 was met, although wave 'ii' may not be complete just yet. If the price returns lower again and breaks the wave 'i' low at 1.1675, that will signal that wave 'iii' pink is underway. Wa ev 'iii' of (iii) should carry the price into the minimum target at 1.1597. This is where wave (iii) reaches equality with wave (i) brown. Tomorrow; 1.1829 must hold, Watch for a decline in wave 'iii' pink to begin. There are two equally likely scenarios developing in Cable right now. This could get confusing! Wave 'iii' may be complete at 1.3304, and wave 'iv' is now underway in a contracting triangle. The final high of wave 'iv' must complete below the wave 'i' low in order not to breaks the elliott wave rules. Or; the alternate count shown circled in red. Wave 'iii' is extending in a larger five wave pattern to the downside. And waves 1 and 2 grey are complete with wave '3' grey expected. Both wave counts expect further losses before the larger pattern is complete. The larger wave [i] could break 1.30, if the price reaches the lower trendline. Tomorrow; lets see if we get a triangle form in wave 'iv', or a larger extending wave 'iii'. Either way, Wave 'iv' must complete below 1.3389. USDJPY dumped again today as expected. the price has now created five waves down in wave (a) of an abc correction. Wave (b) of [ii] should begin soon, with a three wave rally into about 110.30. this is the price region of the previous wave 'iv' brown. Tomorrow; Watch for 108.95 to hold and wave (b) green to begin. The DOW is stuck within a short term correction in wave 'ii' pink. the price broke to a new low this morning, But has rebounded again this evening in a possible wave 'c' of 'ii'. If the price breaks the wave 'a' high at 24889, then wave 'ii' pink will qualify as an expanded flat. Wave 'iii' down should begin either tomorrow or Monday. Teh initial target for wave 'iii' pink lies at 24150, where wave 'ii' reaches 161.8% of wave 'i' pink. Tomorrow; Again, 25086 must remain untouched. Watch for wave 'ii' pink to complete above 24889 in a possible expanded flat. GOLD is back above 1300 again today in a possible wave '3' of 'i'. This is the first signal that the price has now created a very significant low at 1282.16. And has raised the confidence level in the long term bullish count. Wave '2' pink lies at 1288.58 cash, This level must hold in order to remain bullish in the short term. Wave '3' pink should ideally carry higher into about 1315, this will allow a little breathing room for wave '4' to correct. These early stages of a trend change are often a little delicate. But, We know what we are looking for, Five waves up in the direction of the new trend will identify elliott wave 1, followed by a three wave correction to a higher low. At that point we will have a clear elliott wave indicator signal in place. Tomorrow; Watch for 1288.58 to hold. And wave '3' pink to carry higher into 1315. Crude oil reached a low of 70.52 today in a possible wave 'iii' of (i). Wave 'iii' pink does not look complete just yet, Ideally wave 'iii' will break below the $70 handle before completing. The price has broken initial support at the high of the previous wave (i) grey, Which is a good start to this turning tide. The larger bearish signal will come with a clear five wave pattern lower in wave (i) grey. And that is where the focus lies. On the 4hr chart, There are bearish momentum signals a-plenty today! Crude has broken the 50MA and the RSI has dropped below the centreline. Momentum traders are now on high alert for a larger move down. Tomorrow; Watch for wave 'iii' to continue lower and break 70.00. Wave 'iv' pink should then remain below 70.75 support / Resistance line.